Graphic designers (and mappers who are into graphic design), this post is for you! The first thing you need to know about this map is that most of the work was not on the map at all (scroll to bottom to see full illustration). It was on the surrounding design: the donut, the counter-top, the tissue paper (did you notice that subtle grease stain?) As far as maps go, the map itself was pretty straightforward. I hesitate to call it easy, because no matter how experienced you are at graphic design, mapping software has a learning curve at first. But it wasn’t the most involved map I’ve made. Still, there were cartographic choices that I had to make for a contiguous/mainland USA map with 31 points and chunky labels. I’ll share some of those things below. If you’d like to learn about how to add a map to your design, I posted that method that I used here. This post is a sort of celebration of incorporating maps into your design, by sharing some of those techniques. I went with a 1950s-60s diner theme for this design project, so clearly I had to make a mid-century table top. We’ve all seen the type of countertops and tables to which I refer. I decided to make an original design of what I might see in a dream about 1950s diners. So I used an alternating 4-point star repeating pattern with a blue and green that are so similar that – to know they differ – you’d have to see them adjacent to one another. It seems like the truly period tables like this don’t have quite as bold of colors as the current versions being made today. The reason for this could be that all the originals I’ve seen have faded a little bit. Regardless, I wanted to have that original look, so these two similar-but-different colors help give that look that either the pigment wasn’t very bold, or some sunlight has helped the blue and green hues become more similar over time. The tabletop’s repeating pattern is the first of the two layers for the table, and sits at the bottom of the entire design in Illustrator. A lot of the old 1950s formica countertops with smooth texture still have a textured appearance as part of their design. To accomplish this, I created a layer just above the pattern layer. 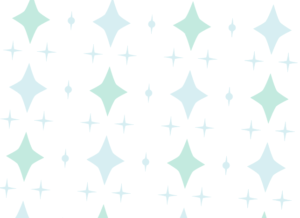 Inside of this upper layer, I added a rectangle with a really pale yellow-to-green-to-pink gradient. Then I added a transparency mask to this rectangle from a photo of marble; I also greatly increased the contrast of this photo prior to using it as a mask. Then, I just inverted the mask, which made this upper tabletop layer sort of visually incorporate itself with the bottom pattern layer. I tilted the pattern a little, to make it look like the donut-paper-bakery tissue setup was a little more organically placed. The bakery tissue is made of 5 layers! To do any sort of rendering in Illustrator, all that drawing I’ve done over the years has been key for me personally. Just like in the graphite arts, I add the shading last in Illustrator. So the bottom most layer was made last for this bakery tissue. I’ll start with what’s – let’s say – the base of this bakery tissue. It’s a paper-bag-brown color to look like the brown bakery tissue. I then gave each of the left and right sides pinked edges. Then I just worked the edges a little to make it look more like a realistic once-folded tissue. To get the lighting of this bakery tissue, I imagined a diner full of bright lights and windows letting in some natural sunlight. Still, there was a brightest light source that I imagined towards the upper left of this table. So I copied the base layer, and used a linear gradient to put some bright lines where I could imagine the light hitting the paper. Again, practice drawing helps a lot with this type of rendering. The bakery tissue needed some crinkles. I took a photo of crumpled wax paper from my kitchen, and used this photo as a transparency mask for the top bakery tissue layer. I just copied the base layer, dragged it to the top, made it full white, and added the transparency mask. This gave it much more natural looking crinkles than I could draw in a vector design software myself. Since there are a lot of light sources in a diner, I made two shadow layers. One fainter shadow for the upper parts and edges of the bakery tissue, and one darker shadow for the bottom edge of the bakery tissue to indicate that the strongest light source was somewhere towards the upper part of this tabletop. To make both of these shadow layers, I first copied the base layer, and then distorted and bent it to the way the shadows might hit the table just beneath the bakery tissue. OK, so there is sort of a sixth layer on the bakery tissue. When the kind bakery employee grabs the donut with the bakery tissue, sometimes the donut goodness soaks into the paper a little. 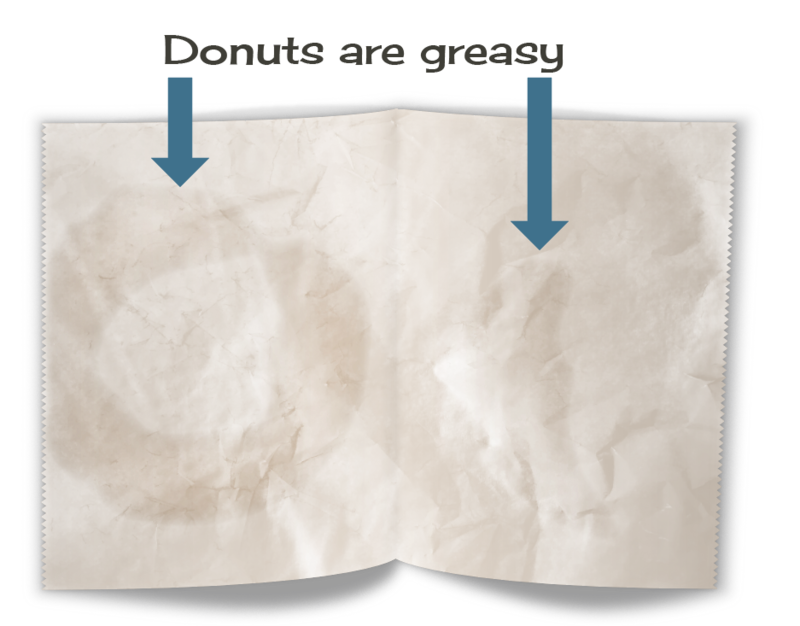 I added a faint donut shaped spot where this would have occurred on the bakery tissue. It’s just couple of gray shapes with some transparency and blur. I then used the color burn mask to make it look like it was “one” with the paper. 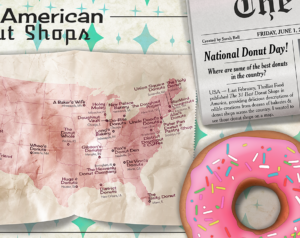 To make the map look like it was part of the bakery tissue, I gave it a nice deep blush pink color, and simply added the color burn transparency mask in Illustrator. That is really it! 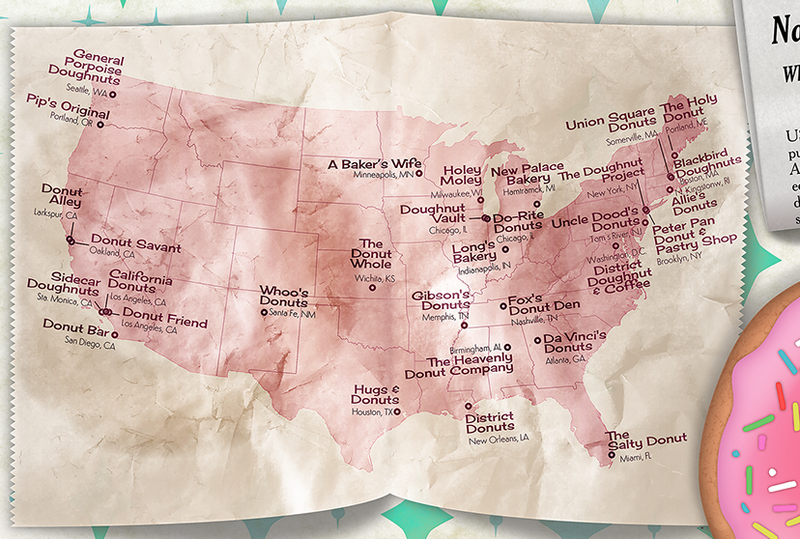 The border layer of the states is just a darker hue of the blush pink color that sits on top of the country as lines. I didn’t use a color burn filter for the borders, but I added a 5% transparency. If you read that post about how to make a map with Maps for Creative Cloud, then you know that the labels were downloaded in the map. I didn’t have to manually add them one-by-one. You also read that I reprojected the map from Web Mercator to Albers Equal Area Conic. This projection gives the contiguous United States a beautiful curve that rises on the coasts. I manually adjusted each of the labels to match this curve. I also decided to add the city names beneath the shop names. Sprinkles. 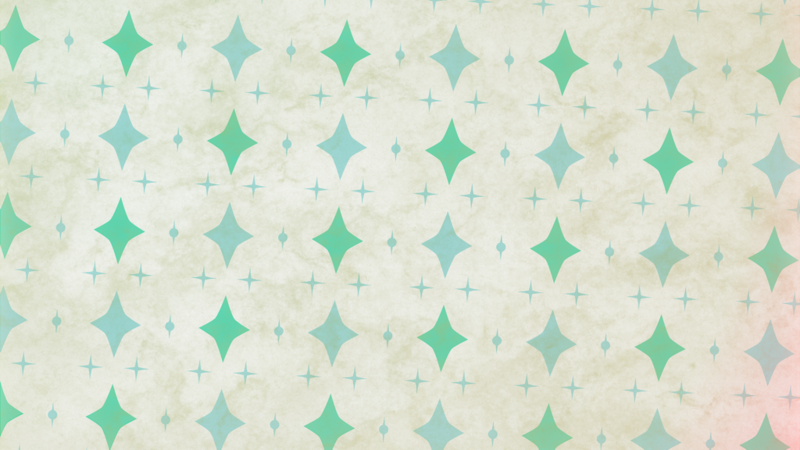 Some sprinkle-shaped vectors with a slight gradient overlay and a dark outer glow. Donut. There is a lot going on in this layer. This has the cake part with a transparency mask made of a photo of pizza dough. It also has the pink frosting, and highlights for the donut as a whole. I also added a secondary shadow to this layer. Donut base. This is just the part that gives the donut its color, following the same idea as the bakery tissue base. This newspaper is designed with vectors, just like all the other layers described above: there is a gradient that mimics where the light might shine brighter on the paper; there’s a transparency mask to help indicate a natural paper texture; I used shadows to help show where the light sources might be. 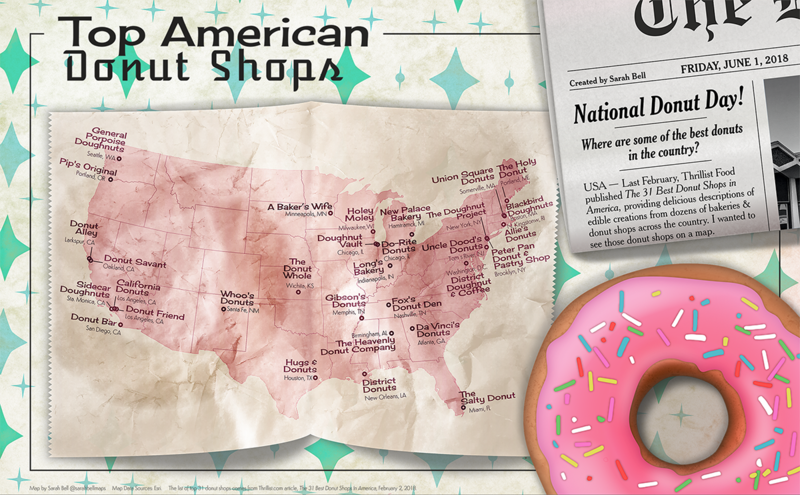 Full donut map and illustration.